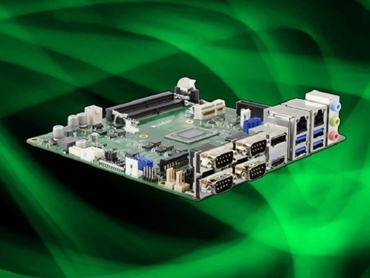 Backplane Systems Technology releases iBASE Technology's new MI988 industrial Mini-ITX motherboard powered by the all-new AMD Ryzen V1000 APU with on-board Vega Graphics. The very latest in motherboard technology from iBASE, the all new MI988 is powered by the new AMD Ryzen V1000 APU with its four CPU cores and eight threads making it perfect for multi-core workloads. Key features of the new MI988 industrial Mini-ITX motherboards include integrated Vega Graphics with up to 11 Vega GPU Compute units that can be harnessed to achieve breakthrough processing throughput for the most demanding graphics and compute workloads; support for the latest in embedded processors from AMD as well as new technology such as M.2 devices; 1 x M.2 M-Key for superfast storage, 1 x Mini-PCIe Socket and 1 x PCIe (x8) slot for all expansion needs; and systems I/O comprising of 2 x GbE ports, 4 x RS-232 ports, 2 x internal RS-232/422/485 ports, 2 x USB 3.1 Gen 1 ports, and 2 x USB 3.1 Gen 2 ports. For display outputs the MI988 has a 1 x HDMI 2.0a port, 1 x display port 1.4, 1 x eDP port and a 24-bit dual channel LVDS port. The MI988 is perfect for applications in the digital signage, industrial control, automation and gaming markets because of its small size and powerful processor.